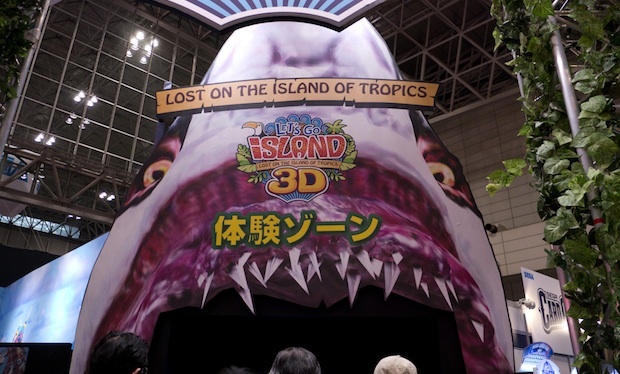 At AOU 2011 in Japan, Sega demonstrates its new 3D date arcade game (Let's Go Island 3D - Lost on the Island of Tropics). This game allows you to sit beside your date in an enclosed space or private booth. Both will be given some sort of simple controls such as a light gun. There will be a point in time that the game is designed to scare your date into your arms (hopefully). It will be an enjoyable experience, maybe have a few laughs and get the chance to spend a little time cuddling and all for the price of 500 yen. There are a few things to make this 3D game note worthy. First off it is glasses free 3D! You don't see that every day but if for some reason it is just not working for you there is a button on the outside of the game to switch it to a flat 2D mode. You also get some cool air bursts on your face (to add to the effects) by some hidden air jets. These jets add to the surprise in certain scenes of the game especially if you don't complete the task. All in all the game is kind of quirky but in a good way. This can be seen even by the cabin design (here), still there is no taking way the amount of fun you can have playing this game. If you ever get the chance, give the game a try. At 500 yen (a little over $6) its worth the time and money for nothing else then the comedic value.